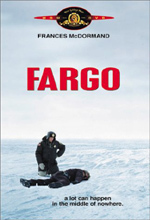 Fargo appears in both its original theatrical aspect ratio of approximately 1.85:1 and in a fullscreen edition on this double-sided, single-layered DVD; the letterboxed image has been enhanced for 16X9 televisions. Only the widescreen side was rated for this review. Although the film shows some wear, for the most part the picture looks good. I found the movie to appear nicely sharp and detailed, with solid definition at almost all times. Any instances of softness were minor, and most of the movie seemed crisp and detailed. Moiré effects and jagged edges presented no concerns. TV. Not surprisingly, the palette used in Fargo appeared pretty subdued. It's a snow-dominated landscape, so whites and various earth tones filled most of the film. All of these seemed well-reproduced, and when we see brighter colors, they appear clear and accurate; for example, the nighttime scene in which red lighting from car tail-lights features prominently looked nicely clean and lacked any signs of noise or bleeding. Since the movie was so starkly lit much of the time, black levels were more prominent than usual, and they looked solid and deep, with no murkiness or tentative qualities. Shadow detail appeared excellent; throughout the low-light scenes, I found the all of the image to be readily viewable with no problems related to excessively heavy or thick darkness. The main concern I found with the image related to print flaws. Slight evidence of scratches, nicks, and grit appeared throughout the movie, and some light grain showed up at times as well. These issues stayed fairly minor, and I must note that Fargo offered more opportunities for defects to be noticeable than most movies; all of those snowscapes made the slightest problems visible. Nonetheless, the faults seemed significant enough to knock my grade down to a still-strong "B". Fargo included a fairly effective Dolby Digital 5.1 soundtrack. (The DVD’s case referred to this as a Dolby Surround track, but it indeed was a 5.1 affair.) Since this wasn't exactly a rootin'-tootin' action movie, the soundfield seemed fairly subdued. However, it provided a nicely involving atmosphere. The forward spectrum dominated and displayed some good stereo imaging. Each of the three speakers offered a lot of activity, and the material blended well between the channels to create a lively impression. The surrounds mainly stuck to reinforcement of the front speakers, but they made the mix more immersive, especially during segments like the wood-chipper scene. It's a modest soundfield but one that suited the film. Less positive are the supplemental features included on the Fargo DVD. All we find are the film's original theatrical trailer plus a four-page booklet that offers some nice production notes. Yawn! Despite the less-than-compelling extras, Fargo deserves a look. The film won't be everyone's cup of tea, as it's a rather unusual piece of work, but it accomplishes most of its goals and manages to keep from being overly showy or silly. The DVD provides good picture and sound though it lacks significant extras. Fargo at least merits a rental for those who haven't seen it, and the film's established fans should be pleased with this DVD.